What means this mod? Skin collection? Dear ... In this mod you have done a modification work on the menu of cars, logos images, names of rivals, some other modification of sounds (improvement) but always trying to preserve the essence of this game. Everything within this mod is modders work (cars, skins, notes, physics, etc). Thank you for your question, I hope you like my work, regards! Fantastic mod Martin! Many thanks for sharing! This is the Argentine Rbr mod? No, I have not done any development to say that this is a mod that represents my country. I would love to be able to do some of that. 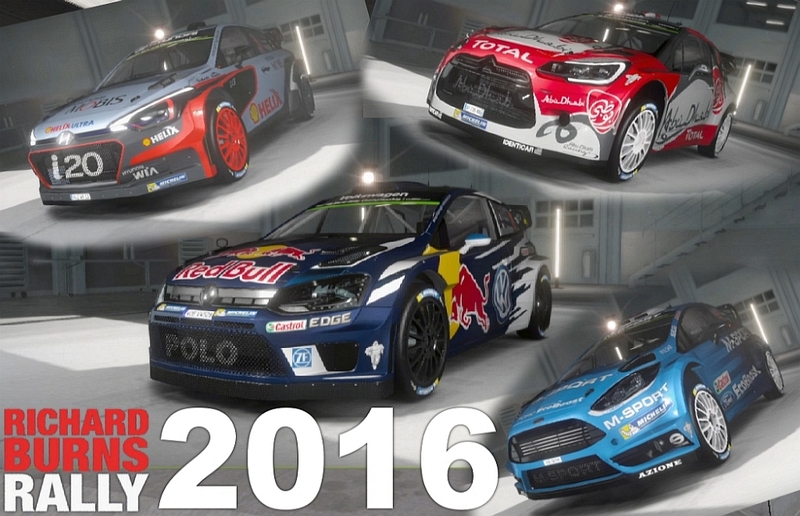 That mod is my work too but in particular it is a WRC MOD with WRC aesthetic, in this case it is a mix of categories RC1 and RC2. With the aesthetic line of RBR. Interesting! But... Why do you use NGP 3.1 instead of 4.4 and updated car physics? 3.1 is so...2015! For me the physics is no problem, because I use CZ mod or use physics directly from ly-racing.de but I think it's a pity you use outdated physics because this mod could be the best shortcut to introduce newbies to RBR. "-What is the state of RBR now? I want to try the latest developments but I don't to spend hours installing mods. -Check RBR 2016" <- We can't really say this unfortunately. There are many people that would like to try the greatest and latest RBR but are put off by the complicated install process. That's why I think your mod is a missed chance. For them, not for me. With 3.1 we are missing filtering in clutch and handbrake. WorkerBee recommends using them if you don't have analog controls (most usual situation). Come to think of it, RBR 2016 could have had the filters preconfigured instead of leaving the defaults at 0. Even better for the user. Also missing in 3.1 are fixes in clutch behaviour, 4 way adjustable progressive bumpstops and variable shift times. Or course it's your mod and you make your choices, but I think it is a bit of a missed opportunity. There are people that don't like NGP physics and prefer RSRBR old physics. What if someone released a mod similar to yours but with old physics (there are old physics for the Polo R, etc) next January and called it "RBR 2017". Don't you think it would be a bit misleading? Anyway, thanks for the mod. I will take into account your contribution, in a few days I will work on this modification or overcoming. Thank you very much! When i start the laucher, it's written "null" everywhere. I was able to select some options but i couldn't set the others. Is there a way to play in 1920x1080? Truly excellent work everything just does what its suppose to straight out of the box well done. Thank you very much! I will continue to work on improvements and updates. This was perfect timing as i was getting a bit bored with dirt, and wanted some alternative, the issues i have with rbr is that there are so many combinations that can be implemented. If there was a way to get a some sort of question and answer system going some those that are new to rbr can suggest combinations that may help newcomers to the game. One example is the use of numeric pace notes, i saw that there is a dat file for this around 85 meg however your dat file is around 250 so i am guessing somthing will be lost in the swap. Also a nice clean effective way and explanation for swapping physics engines, its not clear do you just swap the engine itself or the car files also need changing. Anyway many thanks for your great work its much appreciated. Dear friend, first of all, thank you for the support. The theme of the notes and sounds is a little adapt the system currently used in the rally ... Try to adapt RBR to the world today. Greetings and again thanks for your appreciation! To activate the steering wheel you can open the file car.ini, search the acronym "
How can i add more mod tracks to this package ? And also particle is missing too, anyway i can download it back please ? As for the tracks can be added the tracks in "classic format" which in several forums are the instructions. You can also add tracks in BTB format by creating the RX folder and installing the required plugin (these files are already on any available BTB track with their respective instructions). Finally I am working on a incorporation of particles and some sound effects, I will publish soon. Thank you for your support, regards! Sorry, I forgot to explain that in rally school do not work the physical, only on the tracks. I'm sorry, I'll work on correcting it. Excelente aporte Martin. Nos estamos divirtiendo un monton!! A la espera de la corrección del Rally School. Saludos desde Paraguay. - Unpack the rar. You will see a folder called Richard Burns Rally NGP. -Configure View of each car - You choose a fast Rally (School Rally mode does not work with this mod) and once you are on track, you double-click right mouse button and you will see a panel to change the FOV (I always leave it in 1.30 approx.) And the xyz position of the seat. You save the value and close that panel. - Descomprimes el rar. Te aparecerá una carpeta llamada Richard Burns Rally NGP. -Configurar Vista de cada coche - Eliges un Rally rápido (el modo Escuela Rally no funciona con este mod) y una vez estás en pista, haces doble click derecho de ratón y te aparecerá un panel para cambiar el FOV (yo lo dejo siempre en 1.30 aprox.) y la posición xyz del asiento. Guardas el valor y cierras ese panel. For some reason some cars don't work. I rev but nothing happens. I can hear a slight rev noise but the limited doesnt move and the car wont go when I shift into 1st. Its not all the cars, but it changes. Ex; Championship with M-Sport, worked fine, left the game came back during france and it didn't work. Also when I first started the game was only M-Sport and VW that worked, next day most worked and then back to normal. I could be doing something stupid as Im not smart with this sort of thing. Any help? Thanks! Dear, I comment that both the rally school and the recce stages within a championship do not work .... It can be that! Muchas gracias Luis! Comentarios como el tuyo alientan a seguir trabajando para nuestra comunidad rallystica! La idea base es hacer siempre cosas sencillas para que sea lo más fácil posible usar y disfrutar! Se vienen grandes noticias! I can't download it from Mediafire. It always stops. I can't get past 1.2GB. :( Can someone provide the alternative download link. Mega is great or maybe torrent link. That would be great. Thank you! Try registering in mediafire, it's simple and free ... That way you can download it effectively. Regards! Hello, how do you install new tracks? File's not available, even logged in to Mediafire. guys where can i get ahold of the file? media fire says it's invalid? en mediafire han borrado el archivo, podrias volver a subirlo? Muchas gracias por el pack martin !!! Could you upload it again? Mediafire has deleted the file. the reason why this download is no more available is simple. The author of this mod used and screwed up my NGP physics in an unacceptable way, and even worse, without asking for permission. The way the cars behave in this 2016 mod is just ridiculous. This is not NGP, but it was sold as NGP. So I advised him to withdraw this stuff and develop physics on his own. NGP is much more than a just bunch of R5 and WRC cars as we have vehicles from different eras, and for those interested you can find everything related to NGP at our GVRC site. Apart from that, I seriously doubt that RBR is officially "abandonware", whatever this is supposed to be. It is still sold, and I guess the sellers should have some kind of license to be allowed to do so. Funny thing is although this mod consists of just the original game pimped with some of my plugins and raped physics, people downloaded it like mad, just as if it were a new game. Start working together with the author! Make 2 options in game! I am a bit confused over the comment from workerbee, i would like to say before i start i appreciate any one who puts time and effort in trying to improve RBR so his work is appreciated, however it seems to me that the only crime here is that Martin has not given credit for the parts he has used. For me personally RBR 2016 was the perfect package to renew interest in what is basically a defunct title. Its neat small and works. Not only that Martin has been helpful with any questions or problems. I actually find the altered physics that Martin has done as it applies to the wrc cars as a more effective and realistic model than the 4.4 engine. I would add that i would need more time testing both engines over a longer period as my time on RBR hasn't been extensive, but thats my initial conclusion. I hope workerbee and martin can come to a amicable solution and allow maybe a improved version of the initial work being available. With a possible rbr 2017. So, with all your experience, you did not realize that he f**cked up my physics by increasing the gravitational acceleration to 10.75 ?? I mean, are you serious ? I think I dont need to explain to you what this means for the overall vehicle behaviour. If Martin wants his own physics, he should study vehicle dynamics and start coding and implement all that stuff by himself. I can only relate to my real life experiences, up til 18 months ago i had zero knowledge of sim racing. I can tell you what has the closest connection to the real life knowledge i have. I worked for both proflex and ohlins for a number of years as a development engineer, i wasnt the fastest driver far from it, but i had a a real knack at applying settings to achieve what was the most effective car. Driver preferences are allways individual and personnel, but most competitors have a very limited ability to find a setup that is both safe to drive and fast. I knew Colin quite well as well as his father Jimmy AND Alistair as well as Richard who i new but didnt know as well. Colins settings where off the clock undriveable, but they worked for him, i have respect for what you have done but i can only tell it it as i see it. I dont want to get into any form of slanging match and i am happy to help in any development you have planned. I have done no where near enough testing to give any sort of definitive opinion its all first impressions, and with more hours spent with your physics, i may change my mind, i might not even have installed your setup correctly, but my first impression was the cars felt light. My point was not to pass judgement more to point to the fact what rbr 2016 did for me was get me interested, and keen to try more. Many dont have the skills or time or knowledge to install 40 gigs worth of the french site install. I saw from Racedepartment you have been contributing for many years, which is a credit to the time effort you have put in. But all i can say finally is rally car setups dont always work on logic and they will allways be a compromise because theres so many combinations of possibilities as to what each corner could be. Fine, basically I agree with the setup stuff. But honestly I have given up discussing about setup settings, as it mostly boils down to "NGP setups are crap" and "mine are the best". Maybe it is just a misunderstanding, but RBR is not about this French RSRBR stuff, which actually takes tons of gigs to download. To get the latest NGP (currently 4.4) running, all you have to do is install the vanilla game, patch 1.02 and then our NGP package along with some NGP cars. If you use Angelos' CarManager you can switch easily between about 120+ cars from different eras. If you want to help and participate in physics development, feel free to contact me. Thanks for the offer workerbee whats the best way to make contact. Email should be the preferred way. I cant download, file deleted. I found the other NGP physics too floaty as well. I know this mod has been accused of just being a rip, but what a great one. simple install and I really like the feel of the cars. I have played Richard Burns for years as the original and then RSRBR through its many transitions. I also have real gravel experience (not a professional by any stretch but whatever Martin has "raped" from others and tweaked certainly feels grounded and fun to drive. Workerbee, well done to you and your efforts but maybe you could pull your head in just a bit. you come across a bit prissy. Damn... late to the party again. Just heard about this. With much respect to the modders whose work was being appropriated into this version, it is a damn shame that this isnt available... seems like RBR versions could be like flavors of linux or something. Right... So any of the guys who already install this can upload it again? Someone, please, reupload the mod! REUPLOAD PLEASE !! THANK YOU GUYS !!! It was deleted because RBR is still a commercional product so it was not legal to distribute such package. You are right, sorry. What do you mean by "disagreed with Argentina"? I think that as RBR is practically portable application, we just could put the whole 40GB ZIP containing all the RBR CZ tracks & the most popular NGP cars on torrents. The only thing a user needs to change is to click on .reg file to add RBR custom register and change their resolution / RBR CZ login in RichardBurnsRally.ini. But even those steps could be done with some simple installer.